We have all been there, haven’t we? Then, one day, you swear to yourself to stop this version madness once and for all and decide that you are going to move all your Excel workbooks to GitHub (or any other Git service like BitBucket or GitLab). 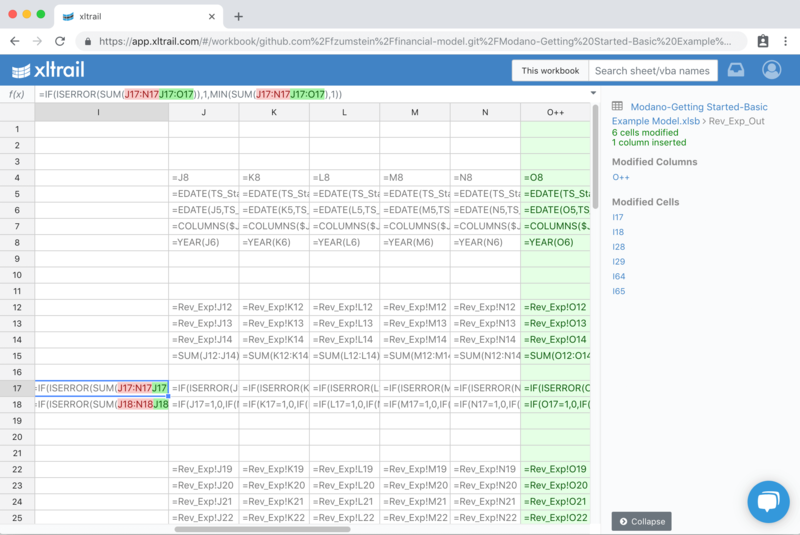 After all, important spreadsheets deserve proper source control. So far so good, but how is GitHub different from a shared drive and what do you need to change in order to use the platform correctly with Excel files? This is a multi-part blog post. Part I (this blog post) highlights 5 basic rules that will let you avoid the most common rookie mistakes that we see with a lot of users who are new to GitHub. 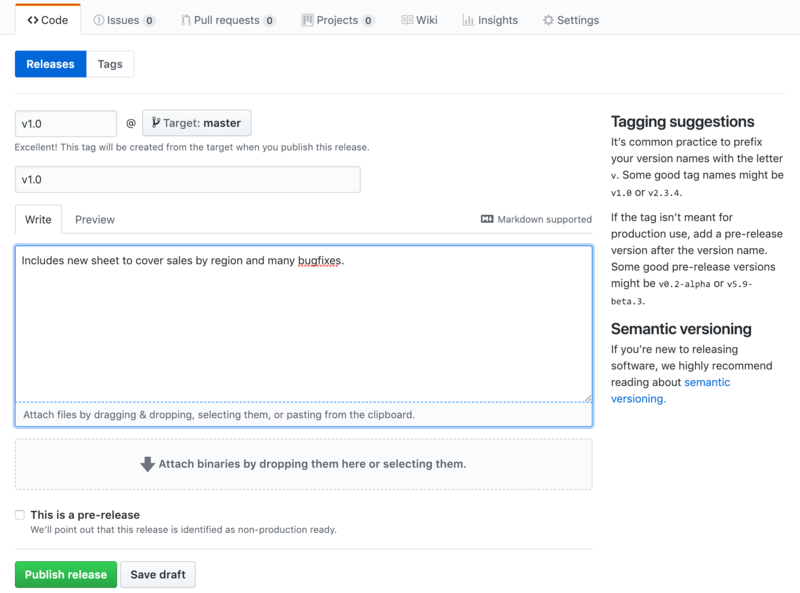 Part 2 will be about automating the release process. 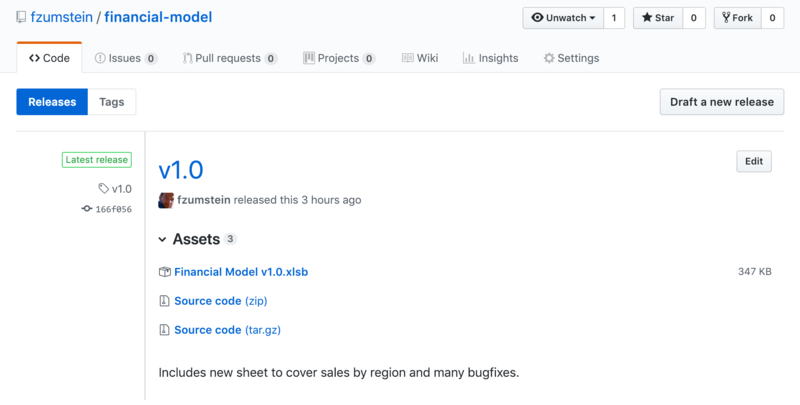 Part 3 will be about branching, pull requests and approvals. We assume (very) basic Git knowledge here i.e. you should know how to commit and push a file to GitHub. 1. No more version description in the file name! First and foremost you need to get rid of all the _v1, _20190205 or final_final expressions in your workbook name before you commit it to Git. Git does the versioning for you so you don’t have to. Instead of giving your files meaningless timestamps or version numbers, you can describe your changes in plain English (or whatever language you prefer) by using Git commit messages. This will allow you to see quickly where a certain change has happened if you ever need to rollback or search for a bug. It’s also a great way of letting your co-workers know what you are working on. Type in a tag and title e.g. v1.0 for both and a description if you want. Now, to distribute your Excel file, you may still want to have a version number in the file name so your users know what they are dealing with. To do that, copy the Excel file locally somewhere (outside of your Git repo!) and edit the name to include the version, then drag and drop it to where it says Attach binaries by dropping them here or selecting them. If this sounds like a manual and error prone process, you are right: we will see how we can automate this step in Part II of this blog post series. 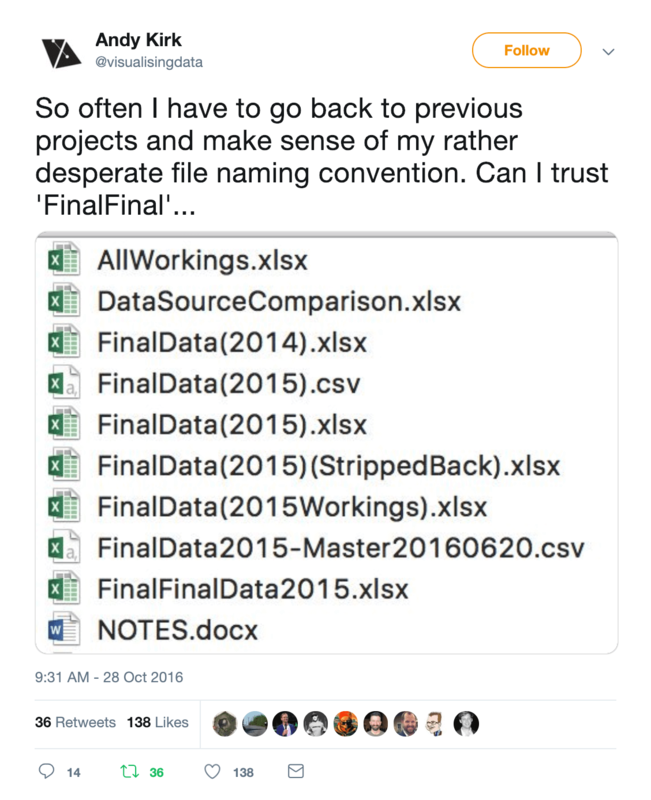 Do you have an established process with your Excel files on your shared drive that requires someone to add a _approved_by_boss into your filename? Excellent! In GitHub, you will typically work on a feature branch followed by opening a pull request where you can select your boss to sign off. Since there is quite a lot to say about branching and pull requests, we leave the details for another blog post in this series. Inadvertently committing temporary Excel files to Git. You can get around this by adding a .gitignore file, see a previous blog post for the details. Also, if you make a lot of commits with reasonably big Excel files, they will quickly eat away a lot of storage on your local hard drive. Git LFS (large file storage) is a Git extension that takes care of this issue and is sometimes included in your Git client. To get all the details about Git LFS, see a previous blog post. This has been a quick rundown of common issues and new concepts when using GitHub for Excel files. We will go into more details in the upcoming blog posts of this series. In the meantime, let us know what you found the most difficult thing when first mastering Git in the comments below!